Of the many sports related promo products available, promotional sports bottles are emerging as the front runner. Not only do they offer relief from thirst and needed hydration during sports activity, they are welcomed by the recipients, are lightweight and colorful, and carry your advertising message - the most important part! 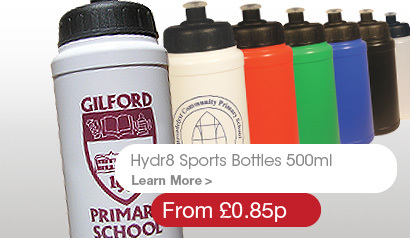 As an advertising medium, promotional sports bottles are a good selection. They are sold at many events and attractions, such as zoos or amusement parks, where people will be spending many hours outdoor. Durability is another factor that you want to have with any promotional item; sports bottles are very sturdy and long lasting. Use promotional drinks bottles at large events, as a free gift at shows or conventions. When your company is participating in or sponsoring a school or sporting event, custom printed sports bottles carry your goodwill message to everyone. If you have a booth, you can either give these products out, sell them for profit, or use them to raise funds for a good cause. Our in house designers are ready and waiting to help you ensure the design on your promotional sports bottles will have maximum impact and our dedicated account managers have extensive experience in the field of marketing through promotional giveaways; they will be more than happy to advise you on which sports bottle styles will be best for your marketing campaign.